1962 CNW Timetable - Many other timetables available on this site. Mid-Continent Railway Historical Society - Mid-Continent Railway Museum--is an outdoor, living museum and operating railroad. The museum has preserved many C&NW items. The Unofficial Chicago Great Western web site - Tom Tolstead's Unofficial Chicago Great Western web site. Former Chicago Great Western Yard, Oelwein, IA - The old Great Western yard in 2004. CGW Train Orders - CGW Train Orders from the Ken Secrest collection. CStP&KC - Chicago St.Paul and Kansas City (CGW predecessor) train orders from the Ken Secrest collection. Wakefield Nebraska C&NW depot - The City of Wakefield has made the Train Deport a museum. Lake Forest, IL Depot - Support the effort to preserve the Lake Forest Train Station! Palatine, IL Depot - Photo of the Palatine, IL depot. Wayne Kahila C&NW Train Page - Photo's of the Chicago & North Western Railway taken by Wayne Kahila. Chicago & North Western #1000 - Chicago & North Western #1000 was the first 300 horsepower Diesel-electric built by ALCO, A developmental history of all AGEIR boxcabs is included on this link." C&NW Milk Cars - C&NW Milk Cars being rebuilt. 110 Records of the Chicago and North Western Railway Company . Utah Rail C&NW Diesels - "Diesels of the Chicago & North Western" by Paul K. Withers, Roster by Don Strack. A CNW history - A Brief History of the Chicago and North Western Line published in 1942. American-Rails.com - The Chicago and North Western Railway, Route of the "400"
CNW Train Orders - Chicago NorthWestern Train Orders from the Ken Secrest collection. C&NW Track Charts - C&NW track charts. CStPM&O Train Orders - Omaha Road train orders from the Ken Secrest collection. 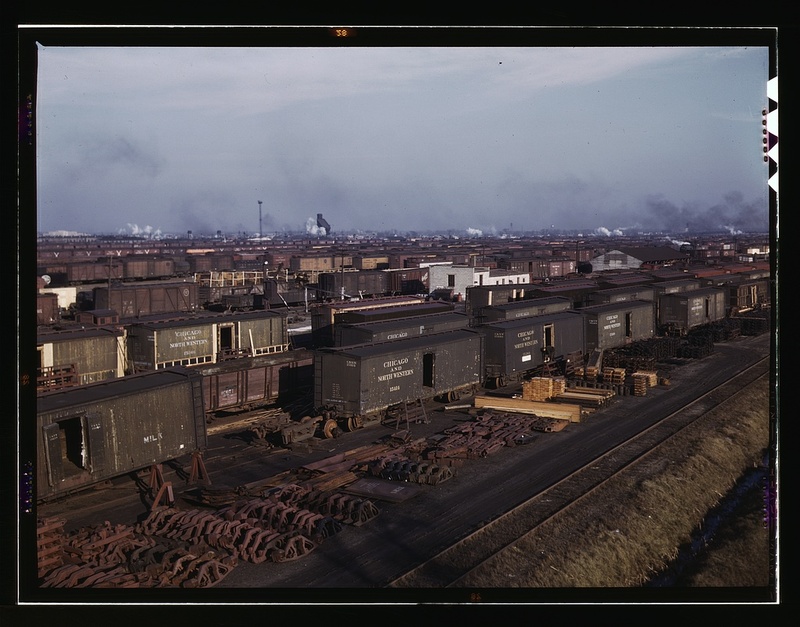 Litchfield and Madison - Litchfield and Madison train orders from the Ken Secrest collection. Sioux City and Pacific Train Orders - Sioux City and Pacific (part of CNW) train orders from the Ken Secrest collection. Passenger Car Photos - Photos of passenger cars from several railroads, including CNW/CMO. Des Moines and Central Iowa Train Order - DM&CI train orders from the Ken Secrest collection. Iowa Central Train Orders - Iowa Central (part of M&StL) train orders from the Ken Secrest collection. M&StL Train Orders - M&StL train orders from the Ken Secrest collection. Soo Line Historical and Technical Society. - The Offical Soo Line Historical and Technical Society. Wisconsin & Southern Railroad Co. - Official web site of the Wisconsin & Southern Railroad Co.
Wisconsin Central Railway and Soo Line - Wisconsin Central Railway and Soo Line maintained by Sussex-Lisbon Area Historical Society, Inc.
Fennimore Railroad Historical Society Museum - Home of Dinky the narrow gauge locomotive. Steam Locomotive dot Com - This site contains information on many steam engines. It has a search engine so you can look for your favorite railroad and engine. Michigan Railroads. Com, Web page for Michigan - Covering all railroads in the state. Genealogy Today - A web site for railroad genealogy search. RR Picture Archives - Pictures of railroads, locations, locomotives, rolling stock, depots and more. Organized by country, railroad, location, date and subject. Wisconsin State Historical Society Photograph Collections - A searchable collection of photos at the Wisconsin State Historical Society. The collections can be searched by keyword or category. Steam Era Freight Cars - Information on various freight cars. Moving West: The History of the Transcontinental Railroad - Brief article with several clickable links to additional general rail history articles. Freight Car Gallery - Photographs of Canadian and American freight cars. Multimodalways - Multiple railroad and other transportation links, including a 1985 CNW system map and 1957 M&StL Timetable. Abandoned Rails - Numerous abandoned railroad lines by state with pictures and brief descriptions. Rappahannock Railroad Museum - The Rappahannock Railroad Museum provides education to the public in regard to Railroads, railroad lines and related events. Pierce Historical Society of Pierce Nebraska - The old depot of the Chicago & North Western Railway Company. Built in 1880. Museum at New London WI. - New London has a well preserved C&NW depot, and a steel bay window caboose. Baltimore & Ohio Railroad Museum - The Baltimore & Ohio Railroad Museum possesses the oldest, most historic and most comprehensive American railroad collections in the world. The Fennimore Railroad Historical Society Museum - The Fennimore Railroad Historical Society Museum, home of the "Dinky". A CNW narrow gauge. Rails Around Michigan - A book about Michigan railroads. Chapter on Upper Peninsula includes photos of CNW and Alcos. South Dakota State Railroad Museum - This museum supports the preservation, education, promotion, and interactive interpretation of railroad equipment, memorabilia, and material specific to South Dakota. Spooner Railroad Museum - The Spooner Railroad Museum is a former Omaha Road depot built in 1902. The Passenger Car Photo Index - The Passenger Car Photo Index, the best resource for finding passenger car photos for North American railroads on the web!!! Kelley Duford's - This site is a little project of mine to showcase some of the H.O. scale model railroad locomotives I have built for myself and others. Maps showing depots - Over 8,700 surviving depots are plotted on dynamic Google maps.